Limits In GOP Plan Could Shrink Seniors' Long-Term Health Benefits : Shots - Health News Caps in the GOP health plan have huge implications for people over 65. In addition to helping low-income seniors with long-term care, Medicaid helps pay for some of their Medicare premiums and copays. In 2015, Medicaid spending topped $552 billion nationwide. People who receive both Medicaid and Medicare and people with disabilities account for more than half of Medicaid spending. Before Carmencita Misa became bedridden, she was a veritable "dancing queen," says her daughter, Charlotte Altieri. "Even though she would work about 60 hours a week, she would make sure to go out dancing once a week — no matter what," Altieri, says. "She was the life-of-the-party kind of person, the central nervous system for all her friends." A massive stroke in March 2014 changed all that. It robbed Misa, 71, of her short-term memory, her eyesight and her mobility — and it left her dependent on a feeding tube for nourishment. Now, she lives in a nursing home. Altieri is 39 and lives in Long Beach, Calif., with her husband and two small children. She can't provide the 24-hour care her mother now gets at the nursing home three miles away — all of it paid by Medi-Cal. That's California's version of Medicaid, which is government insurance for low-income people. Advocates for the elderly now worry that Misa and other low-income seniors all across the U.S. who receive long-term care in facilities or at home could see their benefits shrink or disappear under Republican-proposed legislation to limit federal Medicaid contributions to states. The proposal is part of a broader GOP plan to repeal and replace former President Barack Obama's Affordable Care Act. "My mom is getting the basic of basic care," Altieri says. "If they cut it, I don't know what to do." Nationwide, Medicaid provides long-term care and support to more than 2 million low-income Americans who are 65 and over. Medicaid is funded jointly by the federal government and the states and pays more than half of all long-term care in the country — "more than Medicare, private long-term care insurance and out-of-pocket spending combined," says Matt Salo, executive director of the National Association of Medicaid Directors. And, Salo says, it's the only public insurance that offers such care on an ongoing basis. Medicare, government insurance for people 65 and older, provides only limited long-term care to those who need it after being hospitalized. The GOP bill, scheduled for a vote on the floor of the House Thursday, would transform Medicaid from an open-ended system, in which the federal government matches state spending, to one that limits its contribution — either giving a fixed amount per enrollee, or a lump sum to the states. Critics say such caps on funding would not accommodate the inevitable hikes in cost that will come from the introduction of expensive new treatments or other cost variables. Congress has already amended the bill to allocate additional money for elderly and disabled people on Medicaid. But Eric Carlson, a directing attorney in the Los Angeles office of the nonprofit group Justice in Aging, says such an allocation would not offset the wide funding gap created by caps on federal spending. "It doesn't matter whether it's a block grant or per-capita cap," Carlson says. "Either way the federal government is setting a hard limit on federal funding available, and states are going to be forced to make due with whatever is sent to them. And it's not going to be enough." Carlson is co-author of an analysis released by Justice in Aging that says capping federal Medicaid spending, with either per-capita funding or lump-sum payments would harm older Americans, in part by forcing states to cut services for them "to the bone." "It's really a form of rationing, where you have the care based on the money that's been budgeted rather than on the needs of the people," Carlson says. "And that's entirely backwards." In 2015, Medicaid spending topped $552 billion nationwide. People who receive both Medicaid and Medicare, and people with disabilities account for more than half of overall Medicaid spending. In addition to helping low-income seniors with long-term care, Medicaid also helps pay for some of their Medicare premiums and copays. Under the GOP proposal, nursing care in a facility would remain a guaranteed Medicaid benefit, though states could reduce how much they spend on it if they were forced to cut their budgets. And Republicans might well attempt to loosen or undo federal requirements on the program, with subsequent legislation that would give states more control. Such a shift would "decimate Medicaid's current guarantee of adequate and affordable care," according to the Justice in Aging analysis. 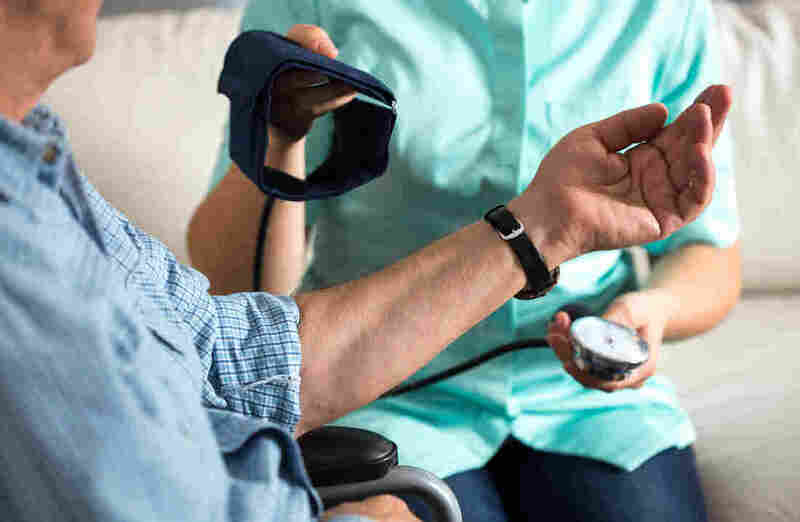 In the meantime, states could do away with benefits not guaranteed under federal law, which include at-home nursing care, personal care — which Medi-Cal covers for qualified beneficiaries — and even inpatient and nursing care in mental health facilities for the elderly. But Oren Cass, a senior fellow with the conservative Manhattan Institute who specializes in anti-poverty law, says the current system leads to state overspending. And that overspending comes at that expense of other things, like education, he says. Cass doesn't think the GOP plan would necessarily harm elderly Medicaid beneficiaries. "A state that wants to continue the spending it does on the elderly can do that if it would rather make cuts elsewhere," he says. "Or it can put up more of its own money." Having more flexibility, Cass says, might appeal to state legislators and health care leaders. "If you ask California today whether it would rather have Donald Trump run its Medicaid program or run it itself, I think most people there — especially liberal people — would say they would rather have the state making the rules," he says. But Pat McGinnis, who heads the California Advocates for Nursing Home Reform, says that prospect worries her. "There are so many federal protections under the current Medicaid system," she says, "and I think most of those would be gone." McGinnis worries that current requirements on hospital inpatient and outpatient services could disappear, for example, along with asset protections designed to keep spouses of those on Medicaid from becoming impoverished. As the debate heats up in Washington, Charlotte Altieri of Long Beach remains hopeful that her mother's nursing home care will be spared any cuts. "We're not at some grandiose nursing home right now," she says. "Where are we going to find one that costs less than this one?" This story is part of a reporting partnership with NPR and Kaiser Health News. Stephanie O'Neill is freelance journalist in Los Angeles who covers health care. You can find her on twitter @ReporterSteph.